This star is located about 24.4 light-years (ly) away from our Sun, Sol. It lies in the southeastern corner (00:25:45.08-77:15:15.28, ICRS 2000.0) of Constellation Hydrus, the Serpent or Water Snake -- southeast of NGC 104 and southwest of Alpha Hydri. Possibly known to some observers as Lucida (or "luz" for the brightest star in any particular constellation) although it is slightly dimmer than Alpha Hydri, Beta Hydri is clearly visible with the naked eye as the nearest conspicuous star to the South Pole, about 12 degrees distant. Beta Hydri is also the closest confirmed subgiant star to Sol and one of the older as well as highly evolved stars of the Sun's spectral class in the Solar neighborhood. It is a member of the Zeta Herculis stellar moving group. As Beta Hydri has become one of the top 100 target stars for NASA's planned Terrestrial Planet Finder (TPF), images of this star and its position relative to the Milky Way in Earth's night sky are now available from the TPF-C team. Beta Hydri is a yellow-orange main sequence dwarf star of spectral and luminosity type G2 IV. This star may have 1.1 times Sol's mass, 1.46 times its diameter (Johnson and Wright, 1983, page 645), and about 3.53 times its luminosity. It may be from 49 to 100 percent as enriched as Sol with elements heavier than hydrogen ("metallicity"), based on its abundance of iron (Cayrel de Strobel et al, 1991, page 4). According to the Yale Bright Star Catalogue, 1991 5th Revised Edition notes entry for HR 98, however, the star has a lithium/calcium ratio that is 10 times Sol's. Based on updated distance data from the European HIPPARCOS satellite, Dravins et al (1998) presented a paper at a Hipparcos Conference in Venice (pdf) that revises Beta Hydri's age to about 6.7 billion years with an associated mass estimate of 1.1 times that of Sol's mass. According to Emeritus Professor Jim Kaler, Beta Hydri entered the main sequence a dwarf star at the cooler end of class F (probably around spectral class F8) but now appears to be a subgiant star that is evolving off the main sequence, as it begins to fuse increasing amounts of helium "ash" mixed with hydrogen at its core. As the star has used up its core hydrogen, it brightened (as its core contracted and heated up to burn more helium) and expanded in size to the star we see today. The churning of gas in a star's outer layers generates sound waves. These waves make a star's surface pulse in and out in different places, as happens on Earth from the seismic waves of an earthquake. Supporting the hypothesis that Beta Hydri is older than Sol, the star's surface pulses in and out with a longer period of oscillation than does Sol -- at 17 minutes instead of Sol's five (see 2/1/00 press release from the Anglo-Australian Observatory). A New Suspected Variable star designated NSV 161, Beta Hydri appears to have evolved to be unusually bright for its spectral type. More information about this star can be found at Dainis Dravins' web page on stellar activity and Beta Hydri. Useful star catalogue numbers for the star include: Bet Hyi, HR 98, Gl 19, Hip 2021, HD 2151, CD-77 15, CP(D)-77 16, SAO 255670, FK5 11, LHS 6, LTT 226, LPM 22, and LFT 43. In 1993, Murdoch et al noted that Beta Hydri appears to exhibit a low amplitude variability with a period of 45 days. This variability may be caused by the presence of a substellar companion. Since Beta Hydri has become a subgiant, it is possible that any planet that held Earth-like conditions earlier in the system's past has now become too hot to support Earth-type life, but that a colder Mars-type planet has become more Earth-like. Today, the distance from the star where an Earth-type planet would be "comfortable" with liquid water is centered around 1.9 AUs -- between the orbital distance of Mars and the inner boundary of the Main Asteroid Belt in the Solar System. Based on an estimated stellar mass for Beta Hydri about 1.1 times Sol's, the orbital period of such a planet around Beta Hydri would be about 2.5 Earth years. As a subgiant star subject to pulsations which affect careful measurements of variations in radial velocity caused by the gravitational pull of substellar companions, astronomers would find it very difficult to detect any Earth-type planet around Beta Hydri using present methods. 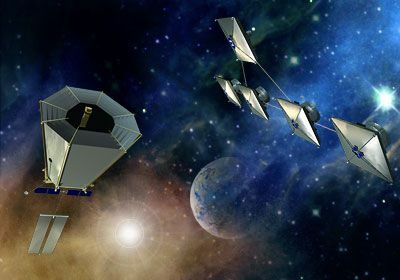 Within a decade, however, astronomers are hoping to use NASA's Terrestrial Planet Finder (TPF) and the ESA's Darwin planned groups of observatories to search for a rocky inner planet in the so-called "habitable zone" (HZ) around this star. As currently planned, the TPF will include two complementary observatory groups: a visible-light coronagraph to launch around 2014; and a "formation-flying" infrared interferometer to launch before 2020, while Darwin will launch a flotilla of three mid-infrared telescopes and a fourth communications hub beginning in 2015. The following star systems are located within 10 light-years of Beta Hydri. Try Professor Jim Kaler's Stars site for other information about Beta Hydri at the University of Illinois' Department of Astronomy. Up-to-date technical summaries on these stars can be found at: the Astronomiches Rechen-Institut at Heidelberg's ARICNS, the NStar Database, and the Research Consortium on Nearby Stars (RECONS). Additional information may be available at Roger Wilcox's Internet Stellar Database. A small and faint constellation in the southern hemisphere, Hydrus (the Water Snake) is located between Horologium (the Clock) and Tucana (the Toucan). For more information about the stars and objects in this constellation, go to Christine Kronberg's Hydrus. For an illustration, see David Haworth's Hydrus.